Ariel Kachuro/Assistant Photography Editor The cranberry mule is easy to prepare and take on the go to any festive pregame. It’s the most wonderful time of the year, and one of many Binghamton University students’ favorite days of fall semester, Santacon. There will be parties for hosting, drinks held up for toasting and ugly Christmas sweaters for roasting. 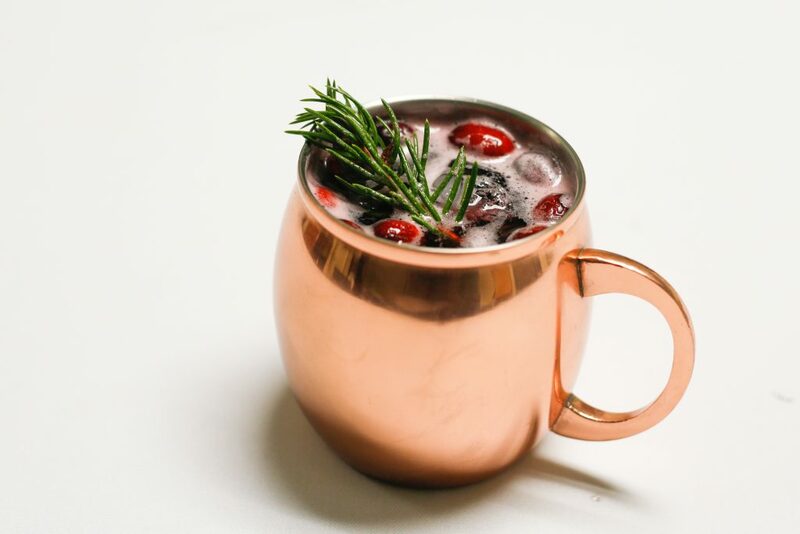 This cranberry mule is a festive twist on the classic Moscow Mule, but perfect for Christmastime. Take it to go on your day of party hopping or make it into a punch bowl big enough for the whole party to enjoy. 1. With a shaker, mix together a cup of cranberry juice and a shot of vodka. Pour in desired cup. 2. Add half a cup of ginger beer to the drink. 3. Garnish the top with three cranberries. 4. Cut the lime into slices and squeeze a slice into your drink. Then place it in the drink as well. Everyone is used to having punch or mixed drinks at their party, but spice it up this time with some uniquely flavored Jell-O shots. 1. Pour water into a small saucepan and bring to a boil. 2. Turn off the burner, and add in the Jell-O package while stirring until it is dissolved. 3. Add vodka to mixture. 4. Pour mixture into condiment cups and refrigerate for one hour. Before removing, make sure they are firm to the touch. 5. Top with a dollop of Cool Whip, then place a strawberry on top with the pointed end up. 6. Top with a small dot of whipped cream, to resemble Santa’s hat. If you’re feeling a bit “grinchy” and your schedule is packed with wallowing in self-pity, solving world hunger and telling no one, jazzercise or having dinner with yourself, these grinch-themed Jell-O shots will be the talk of the party. For the sugar rim, combine sugar and red food coloring together. Dip rim of cup in water, then place in plate of colored sugar. 1. Bring water to a boil in a medium saucepan. 2. Once brought to a boil, stir in packet of lime Jell-O mix and stir until dissolved completely. 3. Pour in vodka and mix. 4. Pour into pitcher and then pour into individual shot glasses halfway. 5. Let shot glasses set in the refrigerator for 20 minutes or until the mixture is pretty firm. 6. Repeat steps to make the Jell-O, but with the strawberry package this time. 7. Pour strawberry Jell-O into the top half of the Jell-O shot glass. 8. Place in refrigerator until firm to the touch. ‘Tis the season to put a Christmas twist on the classic margarita. This drink can be served on the rocks or blended, and the chilly weather outside will keep it cold. 1. Grab a medium bowl. Toss cranberries and a ¼ cup lime juice. 2. Drain out the lime juice with a strainer, then toss with the sugar. 3. Pour onto a baking sheet to dry out. 4. Combine retaining sugar with salt on a plate and combine. 5. Wet the rim of the glass and dip in the salt-sugar mix. 6. Combine the cranberry juice, tequila, triple sec, lime juice and ice in a large blender. 7. Blend until smooth. For a margarita on the rocks, skip the blending step. 8. Pour into the glasses and garnish with sprig of mint and some cranberries to your liking.